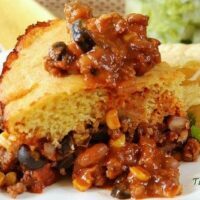 Tamale Pie is a spicy Tex-Mex dish with a ground beef, corn, and bean mixture topped with a thin layer of cornbread. 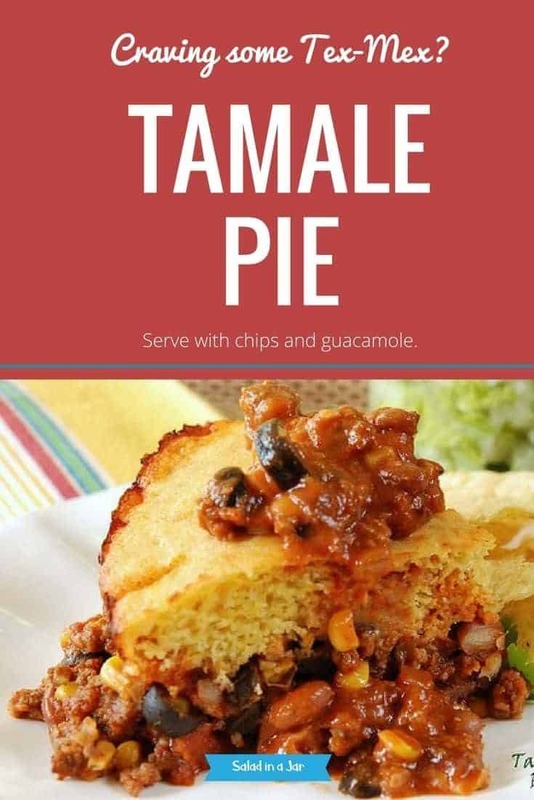 Serve with chips and guacamole. We recently had houseguests from Holland who have been our friends since I was a goofy 17-yr-old exchange student staying at his parent’s house one summer. I prepared this recipe because it is Tex-Mex spicy deliciousness at its best. It’s easy to make ahead of time and holds for hours, if necessary. Makes a lot but it’s wonderful leftover, too. Bert and his son Roelof loved it, and I promised to post the recipe here. Hope the ingredients are available in the Netherlands. I’m not much for processed foods, but I will make exceptions. This is made easier with canned soup and beans. No need to add extra salt. You’ll get plenty out of the cans. Adjust seasonings to your personal tastes, especially the chili powder. I like to substitute smoky chipotle powder for some of the chili powder. Serve this with chips, salsa and guacamole. A salad (out of a jar, of course) on the side completes the meal. 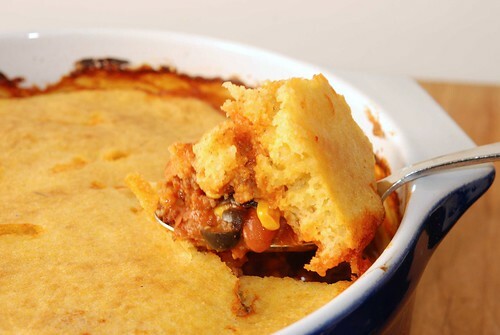 Spicy Mexican vegetable and bean mixture topped with cornbread. Brown onion and meat. Drain off any fat. Add remaining ingredients and pour into two, 2-quart greased casseroles and cover. Bake at 325 degrees for 1 1/4 hours. Combine first five ingredients in small bowl. Add buttermilk or yogurt, egg and salad oil and stir just until combined. Remove casserole from oven and spread corn bread batter evenly over the top. Bake uncovered at 425 degrees for 20 minutes. Serves 10 to 12. *May be doubled for a large crowd. *Want to use a crock pot? 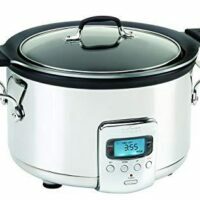 Prepare the meat and vegetable mixture and place in crock pot on LOW anywhere from 3-8 hours. When you walk in the door, preheat the oven, mix up the cornbread mixture and pop into the oven to finish baking. As soon as I saw this picture on the ‘Texas Fiesta Bowls’ (Which I made, & really loved, served with yellow rice and really kept me full) I had to click the link! 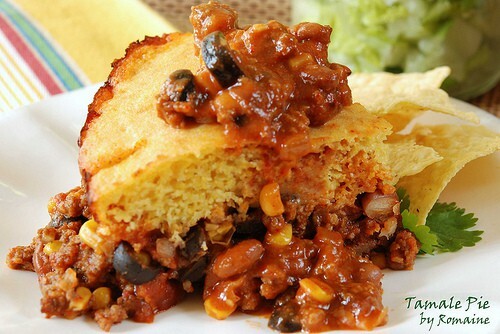 I will be making this soon, I love any cornbread and any kind of bean. I’ve only click a few recipes of yours but I love how they are so simple and never really ask for anything extravagant that I don’t already have. Your site is awesome! Take care! Thanks Stephanie, so glad you found some recipes you like. Great to hear from you. I’ll have to make this recipe when it actaully gets cold here! Looks fantastic. I love how straightforward this recipe is and all of the spices you added to the chili! I’m looking forward to making this in the future. 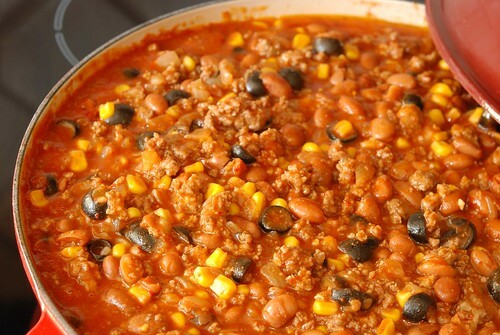 This is a wonderfully hearty Tex-Mex dish! One question-how do you thin the yogurt? Good question. With milk to the consistency of buttermilk. Had something similar to this at work this past week although I am sure yours is better. Will have to try it now that I have a recipe. Looks great! What a wonderful dish! I am going to have to try it out! Yummmm! I printed this one to make when it’s cold this winter. Sounds delicious!